Whether it be howling werewolves, flesh-eating zombies or nasty blood-sucking vampires, these sassy girls pack enough attitude (and weapons) to take them all on without even breaking a nail. Now that's what you call Girl Power. 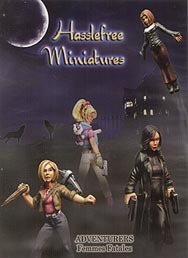 This pack contains 4 unpainted metal figures and 4 bases.